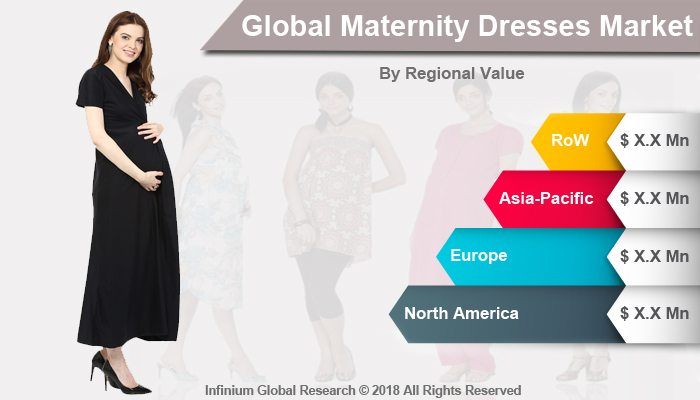 A recent report published by Infinium Global Research on maternity dresses market provides in-depth analysis of segments and sub-segments in the global as well as regional maternity dresses market. The study also highlights the impact of drivers, restraints, and macro indicators on the global and regional maternity dresses market over the short term as well as long term. The report is a comprehensive presentation of trends, forecast and dollar values of global maternity dresses market. According to the report, the global maternity dresses market is projected to grow at a healthy CAGR over the forecast period of 2018-2024. Women wear maternity dresses as an adaptation to changes in body size at the period of pregnancy. Maternity Dresses used to serve the purpose of hiding the baby bump. These dresses are designed with loose and comfortable cuts that expand as the woman’s belly grows. It also includes tabs, elastic and other methods of expansion that allow shirts and pants to be let out. Women have become more conscious regarding the fitting of the clothes. Additionally, maternity dresses are considered part of fashion clothing. Therefore, many women wear maternity dresses even after their pregnancies, until they have lost the pregnancy weight and can fit into normal clothing again. A huge number of pregnant women are likely to work throughout the last months of their pregnancies. Therefore, they look for comfort and ease during pregnancy in order to be able to continue their work. Thus, growing numbers of working women have resulted in increased spending on fashionable and specially designed maternity dresses that drives the market growth. Further, changes in the lifestyle of women in terms of dressing habits are another factor that boosts the growth for maternity dresses market. Women have become more concerned regarding the proper fitting of their clothes that also includes maternity dresses. These maternity dresses even provide several benefits such as stretchable fabrics that stretch comfortably across the body eliminating uncomfortable constrictions, easy mobility, and pressure on the growing womb. Trappings, such as stoles, chunky necklaces, scarves, and shrugs have become an essential part of maternity dresses. Further, the popularity that a maternity dress has gained is all due to celebrity pregnancies. Another significant factor that has brought the maternity dresses to attention is a growth of e-commerce industry, the need to look presentable, the consciousness that the pregnant women have gone through and comfortable feel at the workplace while the baby bump is growing. Several brands and local boutiques are providing maternity wear, which is better in fitting, and designs are better. Many women are accepting pregnancy at teenage. Because of this, pregnancy age range has extended in recent years and changed the market needs and opportunities. The competitors are focusing to generate a position in the market and focuses on specific factors such as design, style, fashion, size, and color. On the other hand, these dresses are used only for a limited period; therefore, this factor is likely to hamper the growth of maternity dresses market. In terms of geographic, North America estimated to dominate the maternity dresses market followed by Europe. Willingness to purchase premium labeled brands drives the growth of maternity dresses market in the North America region. In the Europe region, owing to an increasing trend of women working until the advanced stages of their pregnancy are boosting the growth of this market. Further, the Asia Pacific region ranks as the fastest growing region over the forecast period. The growth of maternity dresses market in Asia Pacific region is due to rise in middle-class population, growing fertility and birth rate in countries such as India and China, and increasing preference for Western styled maternity dresses. The report on global maternity dresses market covers segments such as types and distribution channel. On the basis of types, the sub-markets include tops, dresses, tunics, and bottoms. On the basis of the distribution channel, the sub-markets include supermarket & mall, maternity & baby store, brand store, and online. The report provides profiles of the companies in the market such as Isabella Oliver, Mothercare, H&M, Gap, Hubo Mother, Amoralia, Mamas & Papas, Gennie’s Maternity, Ripe Maternity, and Thyme Maternity. The report provides deep insights into the demand forecasts, market trends, and micro and macro indicators. In addition, this report provides insights into the factors that are driving and restraining the growth in this market. Moreover, The IGR-Growth Matrix analysis given in the report brings an insight into the investment areas that existing or new market players can consider. The report provides insights into the market using analytical tools such as Porter's five forces analysis and DRO analysis of maternity dresses market. Moreover, the study highlights current market trends and provides forecast from 2018-2024. We also have highlighted future trends in the market that will affect the demand during the forecast period. Moreover, the competitive analysis given in each regional market brings an insight into the market share of the leading players.